Mass Effect 3 has to be the first game to get an award for the most hated ending of all time. But why is that? How did it come to petitions (although at least this is being done in a positive light, http://retakemasseffect.chipin.com/retake-mass-effect-childs-play) to a gamer actually bringing the issue to the Federal Trade Commission and Better Business Bureau claiming that the ending of the game does not live up to claims made in their advertising campaign and PR interviews. 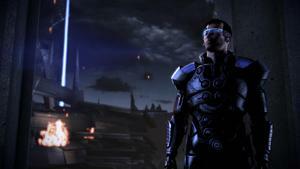 The user wants a new ending within 30 days or he plans to return the game (http://kotaku.com/5894278/mass-effect-3-fan-complains-to-the-feds-over-the-games-ending). But why all the hate? If you have not beat the game yet, do so them come back, this sucker is going to have spoilers leaking from everywhere.